42 OCTOBER/NOVEMBER 2017 | Pr e s by te r i a n s To d ay to ensure orderly living in accor- dance with "God's law," he stipulated that churches should remain closed when not in use for worship. In part, Calvin wanted to ensure that no one used the churches for "superstitious reasons." Closing the church doors also focused worship on glorifying God through prayer and praise while reminding Genevans that the rest of their days were for serving God by serving their neighbor. This reflects Luther's challenge to the Catholic Church's emphasis on indulgences instead of acts of mercy. All of the reformers emphasized that our salvation comes through God's grace in the death and resurrec- tion of Jesus Christ. Worship in the church and work outside the church exist as acts of thanksgiving. In her work as executive presby- ter of the Presbytery of Philadelphia, the Rev. Ruth Santana-Grace sees this hunger for the new work of God. "The power of the Holy Spirit is constantly breaking into the darkness of humanity in new and relevant ways — in ways that often require a 're-formation' of those tra- ditions and assumptions that 'have been,' " she said. As bearers of the gospel, we are called to be mindful of this truth as we seek to embody resurrection hope for this generation. Revolutionary communication Gutenberg's printing press and the reformers' emphasis on reaching people in their own vernacular provided a powerful means for the gospel to transform lives. Geneva served as a hub of the nascent printing trade, employ- ing many skilled printers to publish sermons, books and Bibles in common languages that a network dispersed throughout the Reformation communities of Europe. In Geneva, exiles and native-born residents struggled with differ- ences but were reminded by Calvin of the overwhelming sovereignty of God and the primacy of Christ's command to love God and to love our neighbors. The Rev. 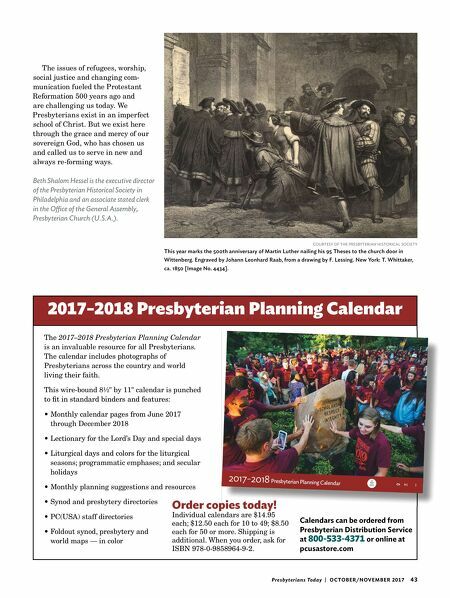 Blake Richter, pastor at Westminster Presbyterian Church in DeKalb, Illinois, and a producer of the PC(USA) resource John Calvin: His Life & Legacy, believes we are in another time of change. "Within a generation, worship, theology, faith formation, church governance and the church's rela- tionship to the culture were trans- formed. What they achieved in light of the society change, prompted in part by the printing press, can be a resource as we face a time of societal change prompted by the digital revo- lution," he said. "It is interesting to note that the church in Calvin's Geneva had a lively interest in teaching its members to read. 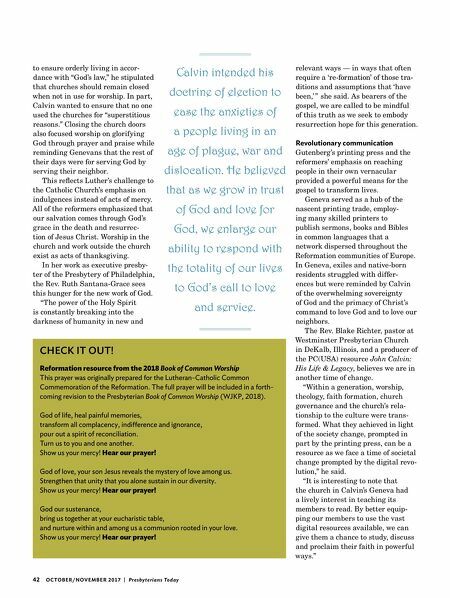 By better equip- ping our members to use the vast digital resources available, we can give them a chance to study, discuss and proclaim their faith in powerful ways." CHECK IT OUT! Reformation resource from the 2018 Book of Common Worship This prayer was originally prepared for the Lutheran-Catholic Common Commemoration of the Reformation. The full prayer will be included in a forth- coming revision to the Presbyterian Book of Common Worship (WJKP, 2018). God of life, heal painful memories, transform all complacency, indifference and ignorance, pour out a spirit of reconciliation. Turn us to you and one another. Show us your mercy! Hear our prayer! God of love, your son Jesus reveals the mystery of love among us. Strengthen that unity that you alone sustain in our diversity. Show us your mercy! Hear our prayer! God our sustenance, bring us together at your eucharistic table, and nurture within and among us a communion rooted in your love. Show us your mercy! Hear our prayer! Calvin intended his doctrine of election to ease the anxieties of a people living in an age of plague, war and dislocation. He believed that as we grow in trust of God and love for God, we enlarge our ability to respond with the totality of our lives to God's call to love and service.